We are celebrating the history of the Fisk Jubilee Singers this Easter and supporting the work of the Not for Sale HOME soup campaign as they work to end modern slavery and trafficking. 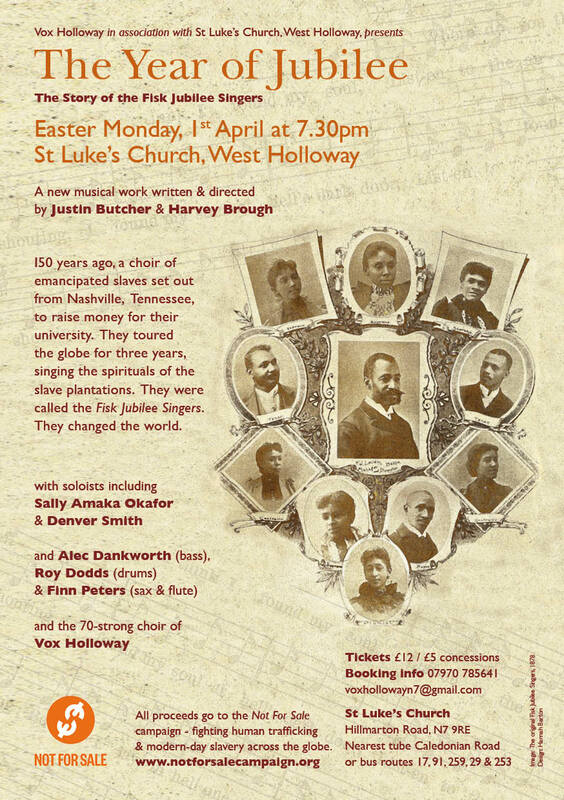 Vox Holloway have a lovely program of old and new spirituals on offer on Easter Monday, 1st April at &.30pm at St Luke’s West Holloway. Tickets are now on sale at £12 and £5 concessions. Please use the contact form to the right if you wish to reserve tickets. Please feel free to use and distribute the PDF version of this flyer as well as the image above. This entry was posted in Choir, Community choir, Concert, London and tagged Anti-slavery, Easter, Fisk Jubilee, Gospel, Not for Sale, Spirituals. Bookmark the permalink.